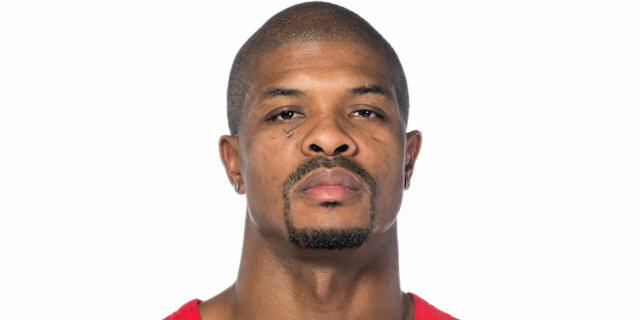 Kyle Hines collected an offensive rebound and sank a pair of free throws with 1.1 seconds remaining to lift CSKA Moscow to a tough 84-82 victory over Baskonia Vitoria Gasteiz at Megasport Arena and a 2-0 lead in their best-of-five Turkish Airlines EuroLeague Playoff series. 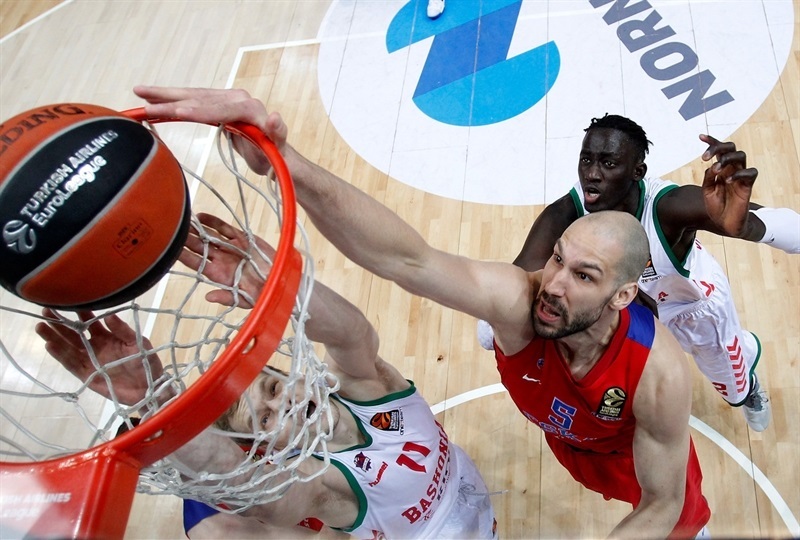 CSKA led by as many as 17 points in the third quarter behind a red-hot Milos Teodosic, but Shane Larkin and Johannes Voigtmann fueled a late Baskonia comeback that saw the visitors tie the game on a Rodrigue Beaubois triple with 12 seconds remaining. 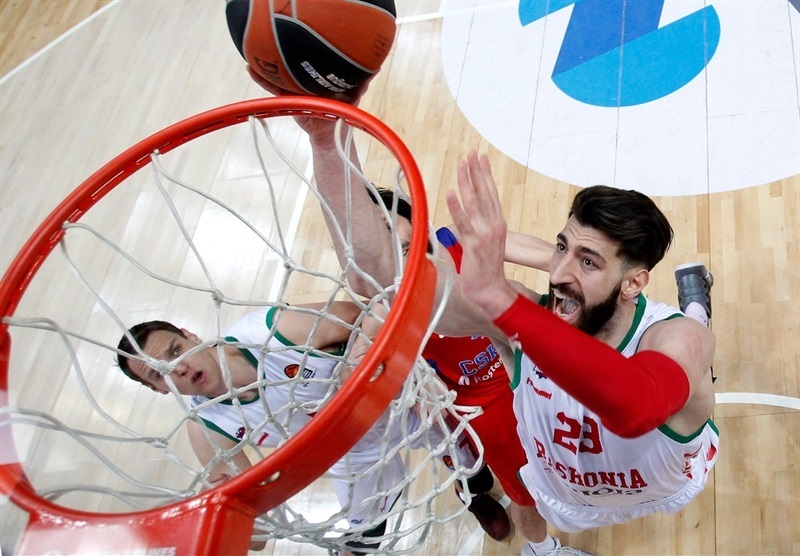 Baskonia hosts Game 3 on Tuesday knowing that to win the series, it must become the first team since the introduction of the best-of-five format for the playoffs to bounce back from a 2-0 deficit to do so. 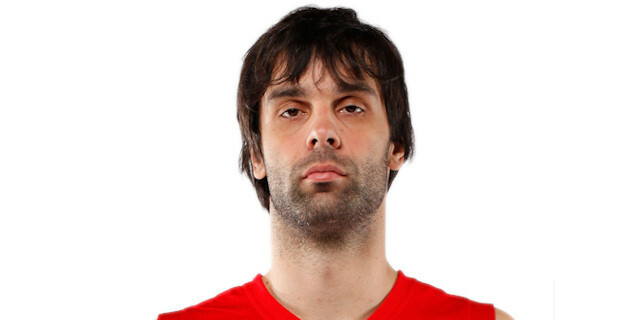 Teodosic scored 13 of his 16 points in the first five minutes of the third quarter as he turned a 40-35 halftime lead into a significant advantage. He also dished 8 assists for the winners. 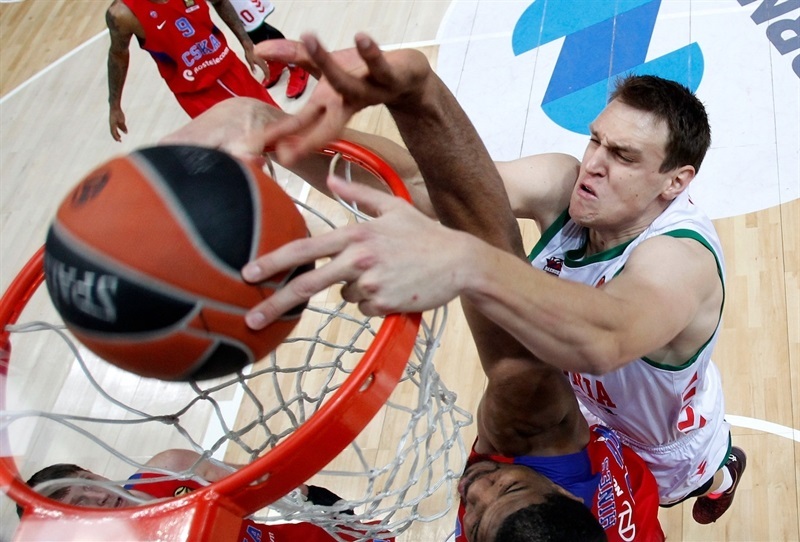 Nando De Colo scored 10 before fouling out and Hines finished with 10 points, too. Beaubois paced Baskonia with 21 points, Chase Budinger added 12, Kim Tillie netted 10 points and 9 rebounds, Voigtmann also scored 10 and Larkin contributed 8 points and 8 assists in defeat. Baskonia outrebounded the hosts 29-36, but were unable to come up with the key rebound that would have forced overtime. The guards opened the scoring with De Colo sinking free throws for the hosts and Larkin a triple for the visitors. 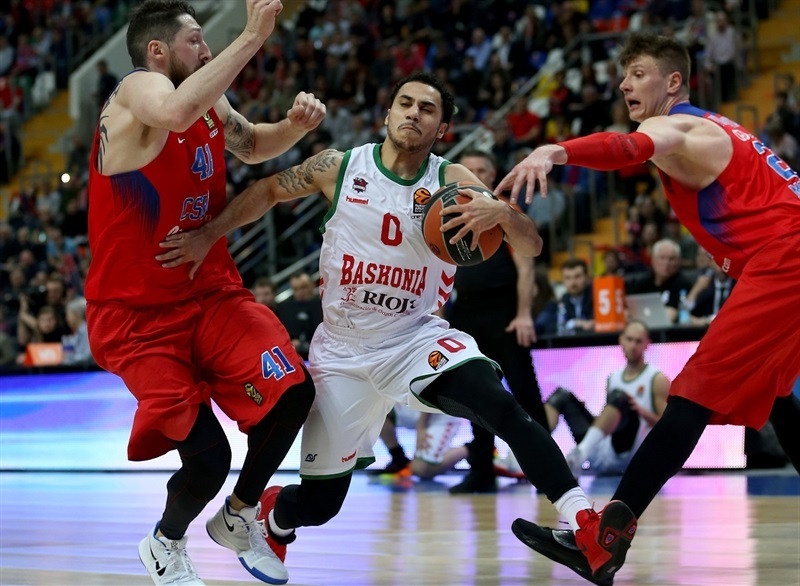 Toko Shengelia pushed Baskonia to a 5-9 lead, however CSKA came right back with a three from De Colo. Nikita Kurbanov heated up with three consecutive baskets to put the hosts up 14-11. The lead went back and forth through free throws by Voigtmann and Hines. Tillie’s triple in the closing seconds of the first quarter kept Baskonia close at 21-20. 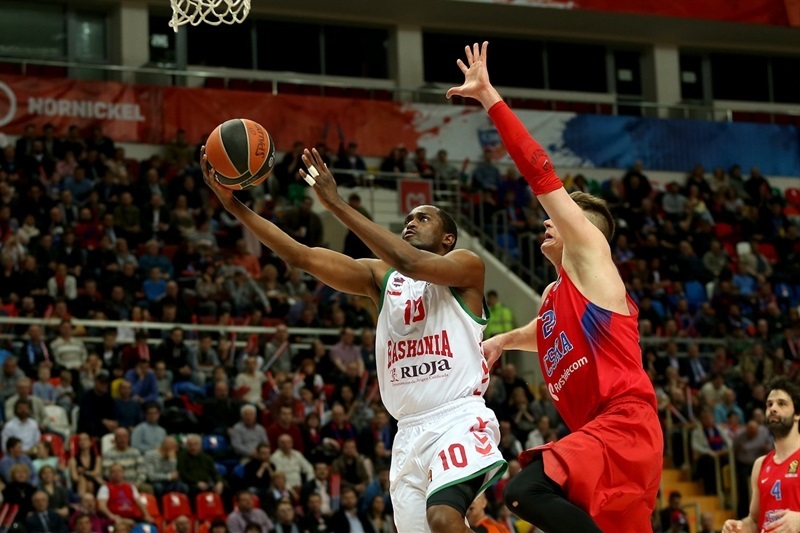 Milos Teodosic generated 5 points through assists to Cory Higgins and Victor Khryapa, but Baskonia answered through Budinger and Ilimane Diop before Beaubois scored 5 quick points for a 28-30 Baskonia advantage. A second Beaubois triple put the visitors up 5, but Tillie committed an offensive foul and a technical foul, which let Teodosic open his scoring with a free throw. 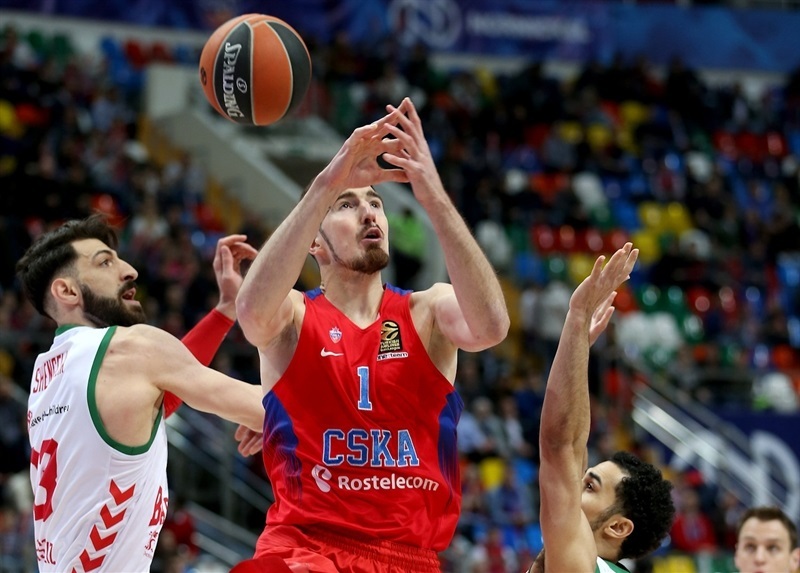 CSKA regained control as Teodosic collected a few more assists and Vitaly Fridzon converted a three-point play on the break and after a timeout, De Colo found a cutting Teodosic to cap a 12-0 charge. A layup by Beaubois drew the visitors within 40-35 at the break. 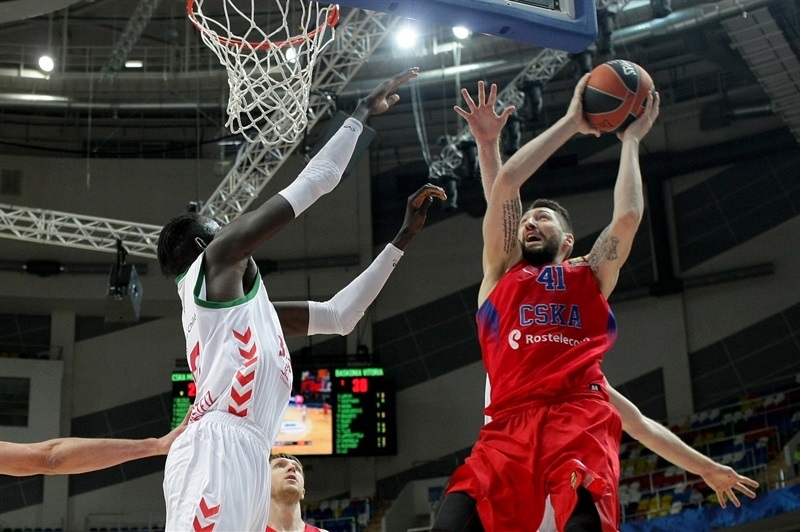 Teodosic hit a jumper and found Fridzon in the corner for a triple that gave CSKA a double-digit advantage, 45-35. Budinger and Beaubois revived Baskonia, but Teodosic nailed a jumper and a three to make it 52-41. 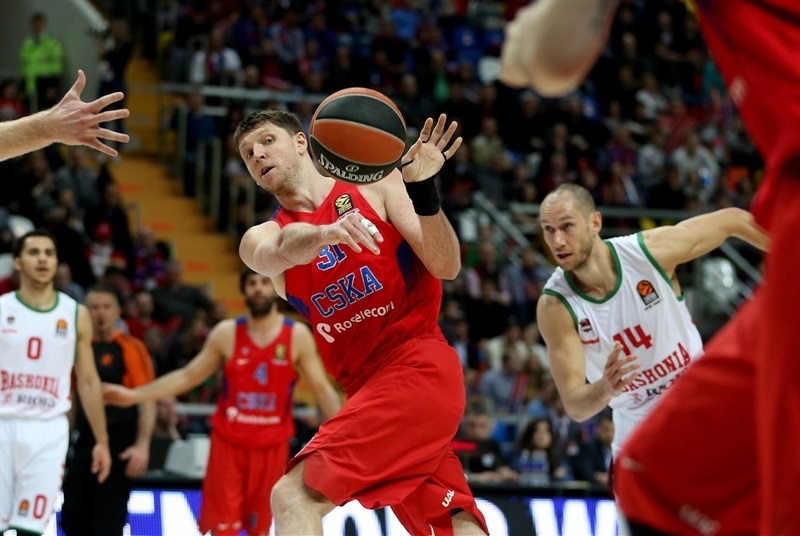 Teodosic added free throws to give him 13 points in the first five minutes of the third quarter as CSKA surged ahead 58-44. 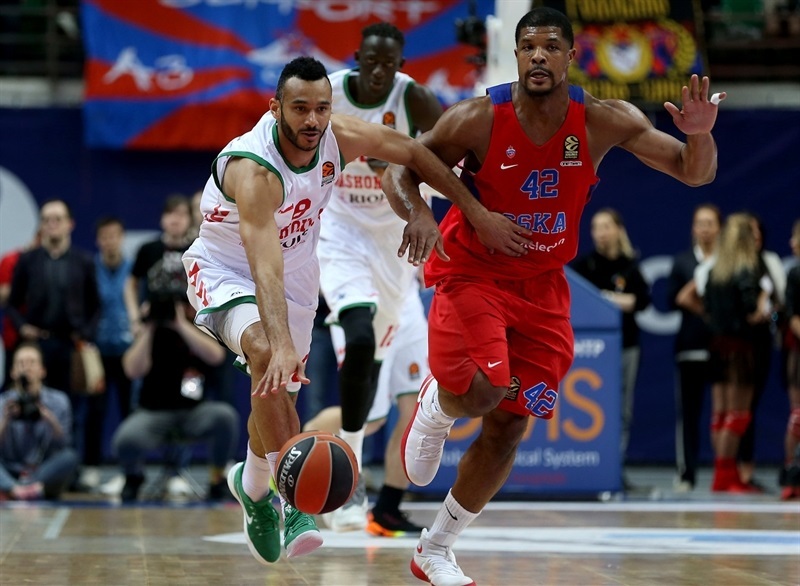 Adam Hanga got his name on the scoresheet for Baskonia with a triple, but CSKA scored on three consecutive possessions to stretch the lead to 17. 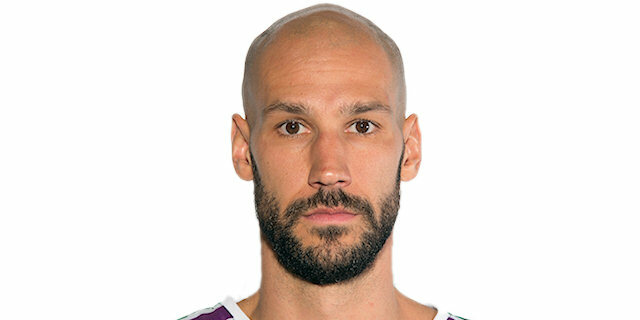 Baskonia closed the gap through threes by Nicolas Laprovittola and Hanga, but Higgins’s last-second layup ended the third quarter at 69-58. Hanga limped off with an apparent ankle injury three minutes into the fourth quarter. 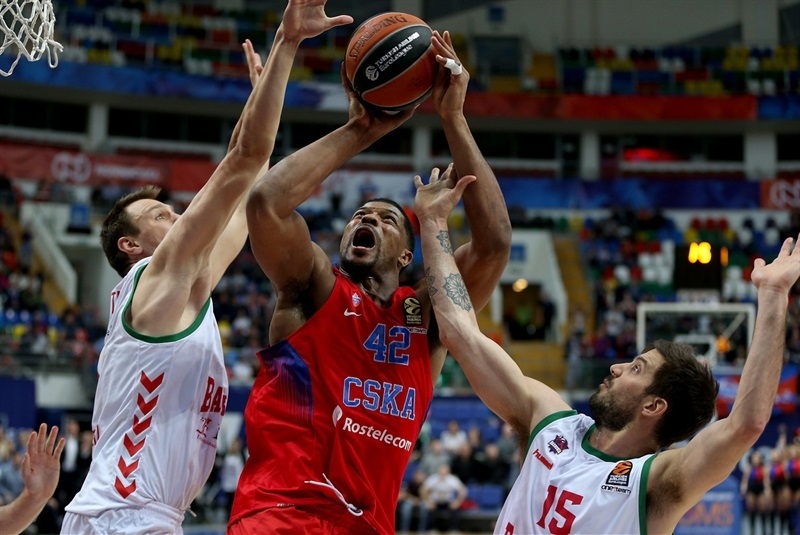 Diop cut the margin to 8 with a free throw, but CSKA remained in total control. Beaubois’s fourth three of the night made it 75-68 with 3:23 remaining and Larkin’s three-point play made it 77-73 with two minutes to go – and De Colo fouled out on the play. But Hines muscled his way to a basket-plus-foul at the other end and sent Tillie to the bench with 5 fouls. Baskonia scored on its next three possessions – including twice on the offensive glass – to get within 80-79 with 37 seconds left. The comeback was completed when Beaubois nailed a three with 12 seconds left to tie it at 82-82, but after Teodosic missed a jumper, Hines grabbed the offensive rebound, drew a foul and sank a pair of free throws with 1.1 seconds remaining to give CSKA a hard-fought victory. 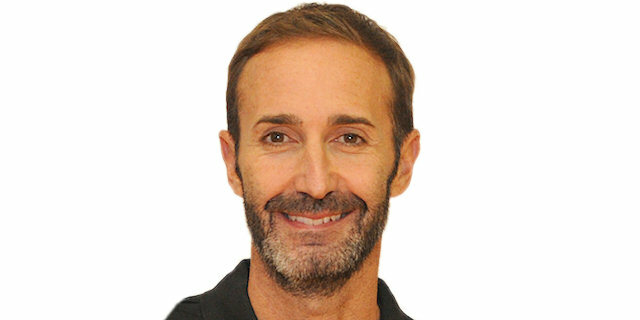 "Congratulations to my players for leading 2-0. 2-0 is 2-0. It doesn’t give you the qualification, but it gives you a good start. This is what we were supposed to do, defend our home-court advantage and take the two victories. Regarding the game, we had very good control, even though the first half was equal. Baskonia led by 2, but we had, if I am not mistaken, a 9-2 run at the end of the first half and took the advantage by 5. And we opened the third quarter, even though it was only plus-6 for us, we played pretty good defense and were more consistent defensively. They made some big shots. 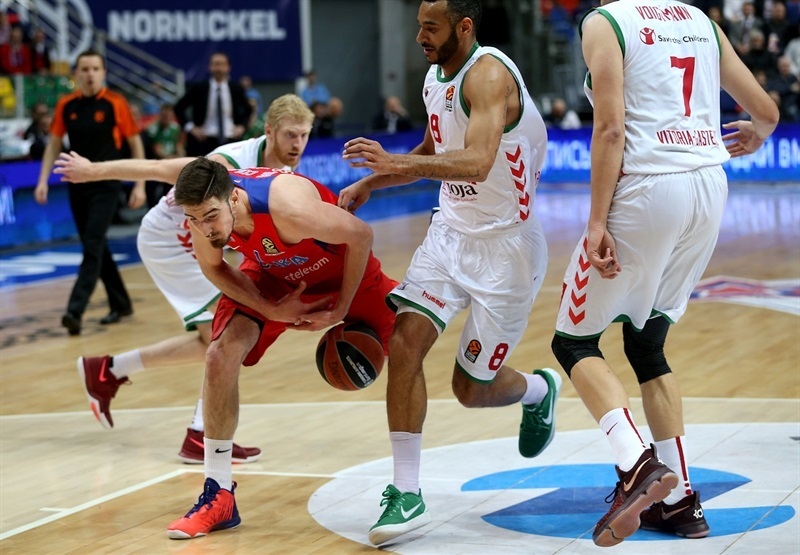 Baskonia on the road, I would say has the same values of last year’s playoff with [Crvena] Zvezda, they shoot the ball pretty well – better than us – from the perimeter. They made 11 three-pointers in Game 1 and 12 three-pointers in Game 2. Most of them were contested and well defended. But we took the lead plus  and some were there when the second unit came off the bench to try their last options. 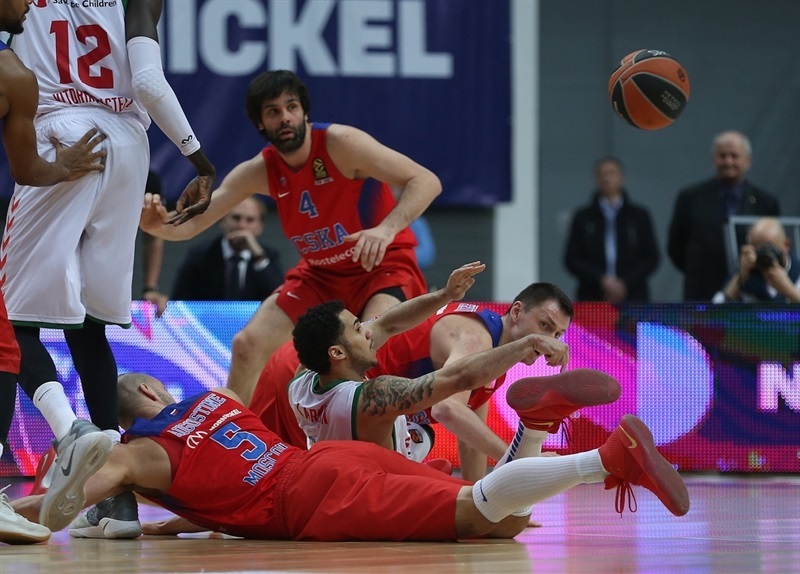 … We came to the clutch moments, unfortunately on that last play, Cory [Higgins] slipped, actually he was pushed by the effort of Teodosic to switch on defense and he lost and that’s why Beaubois made that open look. But then we had a big play with Teo attacking on the block and Kyle grabbed that rebound and made the winning play. Definitely we have to work on press situations, but as I said there are a lot of details we can talk about as a team from the film. We know it will be a tough mission in Vitoria, but we have the character, we have the wish, we have the players to go there and qualify for the Final Four in Spain. " "We dominated the first 17 minutes. The most important moment for me was 31-33 and I called timeout to talk a bit because I had two. And to rest longer and finish the first half in a very good way. And it was the opposite. We turned the ball over three, four times and they took advantage to finish the first 20 minutes 5 points up. In the last 20 minutes, the key of course was the first seven; they played very well, we did not defend well, especially the foul situation with Milos Teodosic and he played comfortable. But when they led by 14 points, we believed in our team, in the things we have done. We put on the court different players, secondary players, but believed in the things we have done. And we had the opportunity to beat them in the last minute. " "We had a big lead, I can’t remember exactly what it was. We allowed them to make some big shots because they put pressure on us that allowed them to come back. But we were able to make plays down the stretch. Aaron [Jackson] had a big layup, a big finish and we had a couple big stops, so we were able to make pays and finish the game. And that’s what the playoffs are all about. " "It was a tough game. They played great at the end. They pressured us into turnovers and missed shots. We played hard, like coach said, for about two and a half quarters, but we let them back into the game and we can’t do that. We are happy with the win. Any time you can get a win in the playoffs is great. We have one more and we want to take care of it early. " "Tonight the only thing that was important was to win the game. Maybe we were a little bit lucky at the end, but the most important thing is that we won. We cannot relax because we are winning 2-0; we need to go to Vitoria and try to win the third game. I think in Spain we can be a little more relaxed mentally and I am pretty sure that we will play a little better than we did here because we won’t feel as much pressure, but we will see. We will rest the next five days and prepare for the game in Vitoria. "